In this the concluding part of the series, we’ve been looking at the best models for studio and wildlife photography. Admittedly, as a full-frame camera delivering 40MB Raw files the D800E isn’t likely to be the first choice for wildlife. A Nikon D4s with a 11fps burst rate or an APS-C Nikon D7100 with its 1.5x crop are the more likely choices, but there are always some compromises to be made and there’s a compelling case for increased resolution within a given format. As we’ve revealed in our tests, the full-frame sensor in the D800E has a wide dynamic range, good color discrimination, low noise and it has excellent resolution, amounting to as much as a 30% increase in peak sharpness in some cases. While the Nikon D800E requires the best quality lenses to achieve optimum results, when it comes to fast-paced photography either in the studio or on location, the best possible technique is required to reduce blurring and maintain this advantage. Besides the performance and obvious physical characteristics of size and weight of individual lenses, some key points to remember when comparing models for this type of work are the minimum focus distance and reproduction ratio. One model may focus closer than the next, which is a benefit but it’s prudent to check the maximum magnification is higher as well. For instance, Nikon’s new 400mm f2.8, announced only yesterday looks promising with regard to higher image quality and improved exposure reliability. However, while the new shorter minimum focus distance is useful, the slightly lower magnification means the effective focal length is slightly shorter than the old design. Using extension tubes is an easy way to reduce the minimum focus, however, Nikon has yet to add any with automatic diaphragm control. 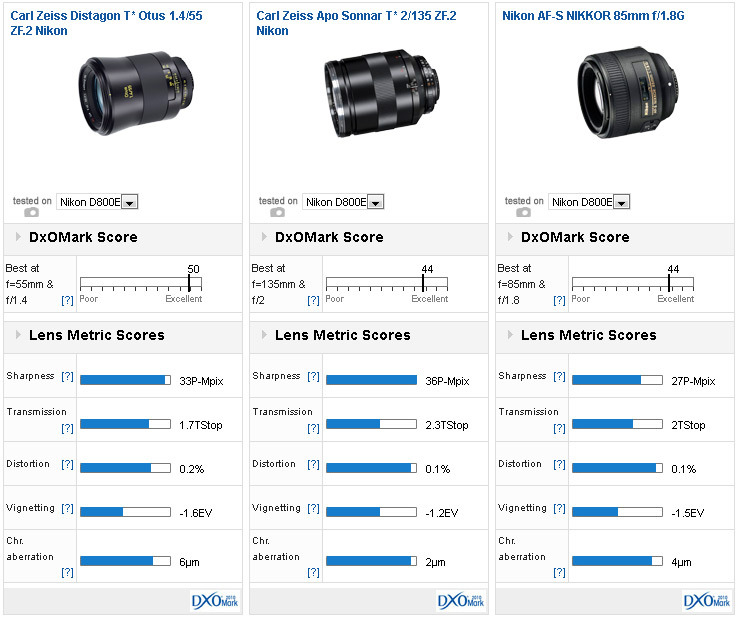 As we mentioned in part I, the best corrected, best performing model of any focal length on the Nikon D800E is the Zeiss Distagon T* Otus 1,4/55, however as we also revealed, it’s not quite the sharpest – that accolade goes to its sibling, the Apo Sonnar T* 2/135. In joint second place, with a DxOMark lens score of 44 points is the latest iteration of Nikkor 85mm f1.4 – Nikon’s premium portrait model for the last four decades. With the more modestly priced f1.8 model achieving the same ranking on the D800E, albeit with slightly lower peak sharpness, the choice now is not quite so clear-cut. 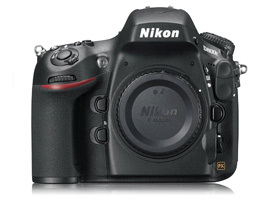 At $700, and lacking some of the build quality, it’s a third of the price of the f1.4 model. Given advances in lens design it seems little odd that the best performing 50mm Nikon lens in our database is the discontinued film-era AF Nikkor 50mm f1.4D. Still, the Sigma 50mm f1.4 EX DG HSM performs similarly, followed by the current AF-S Nikkor 50mm f1.4G, though it isn’t quite as sharp overall. 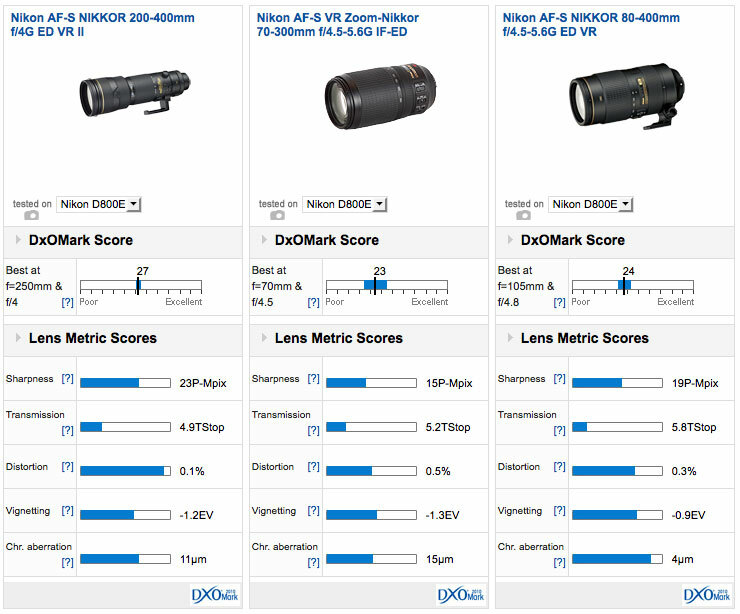 Although Nikon has two lenses in the top 5, rival Zeiss has three and of those two occupy first and second position. The Otus is an outstanding performer but it’s similar in size to the firm’s Apo Sonnar T* in second place. At $4,000 it should be good of course but it doesn’t have AF and, on the D800E, it’s actually trumped by the Apo Sonnar in sharpness. Most of the gains are in the outer field but in real world use it would be difficult to tell the two apart. At $1,600 the Apo Sonnar looks ‘cheap’ compared to the Otus and Nikon’s 85mm f1.4G. At a third of the price of the f1.4 model, the best value must be the Nikon 85mm f1.8G. Build quality, while excellent, doesn’t have the same rugged feel of the f1.4 and it can’t quite match that model’s sharpness or rendering, though that’s a subjective quality. It’ll come as little to surprise to learn the best performing telephoto models on the D800E are the Nikkor AF-S 200mm f2G ED VR, 400mm f2.8G ED VR and 300mm f2.8G ED VR. While these models are suited to wildlife they are unashamedly pricey and aimed predominantly at sports photographers, where the fast maximum aperture is mostly required for AF compatibility when mixing with the firm’s various teleconverters. Nikon are well known for supporting wildlife photographers with models that include the AF-S Nikkor 200-400mm f4G ED VRII at the high-end as well the 80-400mm f4.5-5.6G ED VR and to a lesser extent the AF-S VR 70-300mm f4.5-5.6G IF-ED. All three of these models are suitable for full-frame use, though they’re unlikely to be used with teleconverters. Nikon, like other makers, assume users would adopt an APS-C camera instead. Sigma’s 50-500mm f4.5-6.3, 120-400mm f4.5-5.6 and 120-300mm f2.8 EX DG models may also be contenders. We’ve chosen Nikon’s three most popular lenses with wildlife photographers, though, admittedly, they’re more likely to be utilized with an APS-C body than the 36-Mpix D800E. Even so these lenses perform well, especially the two more exotic models where their performance at the longer focal lengths matters most. A long time favorite that recently underwent a revamp adding the latest VR (VRII) spec and Nano coating to improve contrast with digital sensors the $6,999 the AF-S 200-400mm f4 VR could never be described as cheap exactly, but it is good value compared with the firm’s super-telephoto primes and it has excellent sharpness and uniformity at the long-end. Far more compact and portable is the recently revised 80-400mm. This model adopts Super ED glass (found only on one other model in the firm’s range – the 200mm f2) and now includes a sonic type AF motor over its predecessor. Optical performance is better at shorter focal lengths but it’s still very good at 400mm though some corner softness is evident on the D800E at full-aperture. Although the weakest of the three optically, the modestly priced ($699) 70-300mm f4.5-5.6G IF-ED puts in a spirited performance at 300mm – just that it really needs to be stopped down a little.